Our homily last Sunday, based on the Second Reading (Eph 4: 1-6) focused on unity. As Father Newfoundland pointed out, there are at least 12 references to unity in that reading. In God's inestimable timing, this reading and the homily came at just the right time for me to hear it and apply it to an area that needs attention in my life. You see, I tend toward the sin of pride. This comes out in many ways, but one of them is in thinking - believing, actually, with every fibre of my being - that I am right, and since I am right, you must be wrong, which makes you sadly uninformed. I don't mean you, dear reader, but rather the others out there who don't agree with me on any given issue. Health care, taxes, education, and the economy aside, most of my concerns are faith-based. Most of my life's business and activity is wrapped up in Catholicism. It provides the framework of who I am, and so much of what I think about, talk about, and care about, are matters of faith. Which, of course, means that my foolhardy pride and misguided right-ness are also wrapped up in matters of faith - ie. Catholicism. When the conversation rolls around to church architecture, music during Mass, appropriate attire for attending church, clerical orientation (compass-wise, not lifestyle-wise, though that too, is a hot topic, isn't it?) all bring out firm and oft-expressed opinions. I can be stubborn and illogical, argumentative and insensitive. I am often unkind, and I seldom stop to consider the other person's view because I know I'm right, and being right is what's important. How is that worthy of living in a manner worthy of the call I have received as a child of God? How is it humble, and gentle, or patient? How does it preserve unity, or share our one Lord, our one faith? How am I remembering that my God is the God of all? Is it more important that I be right, or that I share the Love of God the Father, focus on our hope of eternal life through the death and resurrection of Jesus Christ our Lord and Saviour? I have resolved that the next time someone expresses an opinion different from mine, or has a different expression of faith than mine, I will try to build up the Church of God on earth by seeking unity rather than division. I will look for what we have in common, for that is where God is present - not in the songs chosen for the liturgy or the language used during the Mass. 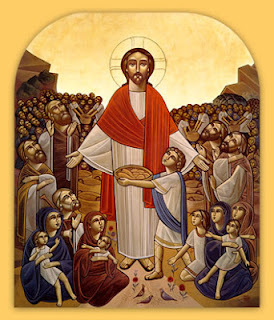 As the Gospel reading for the day (Jesus feeds the 5,000 with five loaves and two fish) reminds us, it is the work of Jesus to multiply what we offer Him. I pray for the grace to be able to offer Him love and patience and gentleness for the sake of God who is in us all, through us all, and in us all. Following the example of St. Therese the Little Flower, I desire as many souls as possible to know the love of God, and to be with Him in eternity. We walk a fine line, don't we, between being really passionate about our faith - knowing deep down in our gut that it's right and true and honest - and at the same time being charitable towards others who aren't at the same place we are. The world barely even acknowledges God at all, so it takes a good amount of finesse (which I definitely do not have!) to be able to find common ground with anyone! I think that what is described here is a microcosm of what is generally known in the Church as an ecumenical debate or dialog. No one puts their whole heart, mind, soul, faith, belief, trust and love in something unless they think it true. No reasonable person would accept a belief if they doubted its validity. So, when something is said or debated that contradicts what we believe, it is a natural tendency to defend that belief, but as this posting said, it should be done in love. It was either JPII or Benedict who once said that ecumenism is not the watering down of our doctrines in order to become more acceptable to others for that is not being true to self. First we must establish that there are differences and to embrace these differences before we can come to an agreement on the more common factors of faith. The Church has and always will have doctrines that are non-negotiable and it is from these that dialog should proceed, not by denying them or diluting them for the sake of unity. Unity based on half-truths or lies is not unity, but error cloaked in sentimentality. Christ used two methods of inducing people to the Truth; He invited us to "come and see!" and at other times he used a bit of strong arming; "Unless you eat my body and drink my blood, you have no life within you." The latter leaves no room for discussion. People in general do not like having no options to choose from, and Christ did not leave them any options. I think with most of us that are faithful Catholics, we dialog with others that disagree with us, hoping against hope that we are able bring them to see the truth of our belief. We plant the seed and expect to see its growth right away. That's when we are disappointed because of our lack of patience. When planting a garden, we do not throw the seed into the ground haphazardly, but carefully, in certain measure. How many of us will plant carrot seeds then sit on the ground waiting for them to germinate? It doesn't happen that way. We plant and water that seed and let nature do it's thing. In faith, we do the same thing; we plant and water(support) that seed of faith and then allow God to do the rest. Remember, we do not convert others, God does and from the heart. We only plant the seed and that seed will fall on receptive ground only if it is done in love. Excellent points, OC. The Truth should never be compromised, and certainly never watered down (we've all seen where THAT gets us!). When I wrote this, I was thinking specifically of discussions I've had with other Catholics, and remembering things I've said in the past. For example, my strong feelings about some of the music that is during the Mass. I have expressed my utter conviction that my opinion is correct in implacable and uncharitable terms. While there is an underlying truth: not all music is suitable for use within the Holy Sacrifice of the Mass - is my attitude unitive or divisive? Very nice to hear from you again, OC!